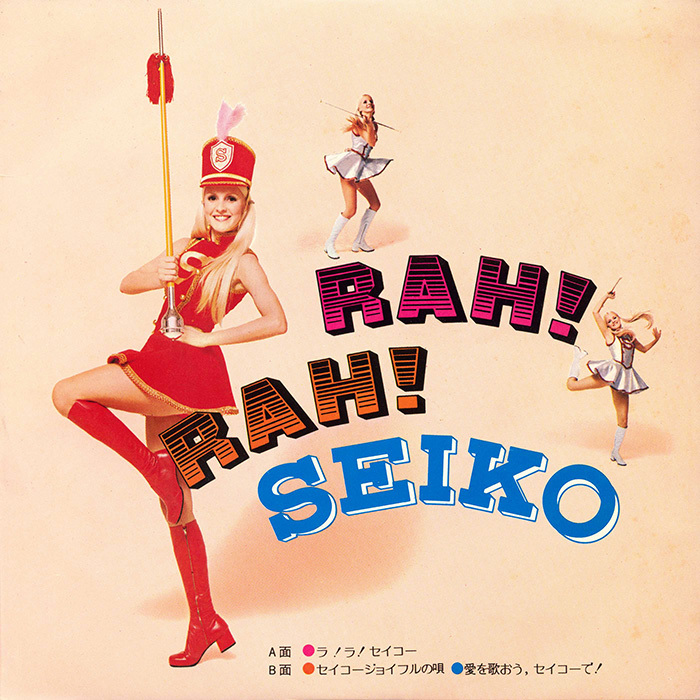 One of the unusual promotional items produced by Seiko over the years was a record with a series of tracks that refer to Seiko. The record has three tracks and was named after the first track, a marching band song, called Rah! Rah! Seiko. The initial track on side A, Rah! Rah! Seiko, was written and composed by Asei Kobayashi, the second verse is in English and these lyrics were written by Mark Bruno. The track is performed by Duke Aces & Singers Three. This track has one of the most unusual pronunciations of Seiko I have ever heard but I am guess this was done to fit with the flow of the lyrics. The second track on side B is called The Song of Seiko Joyful and was also composed by Asei Kobayashi. The lyrics were by Kazumi Okada and it was performed by the group Simons. Finally the third track Let's Sing a Love with Seiko! was written by Michio Yamagami and composed by Hideo Ichikawa, it is performed by the Singers Three. The record is marked as being released by Seiko Hattori Watch Shop and being not for sale but a promotional item. The record seems to have been used as the basis for a promotional campaign that also included a couple of different press advertisements that would have been placed in magazines and also likely used in store for promotion. The record does not have any date listed on it or the sleeve but these adverts contain a number of different models that help determine the date for them. The first advert contains a couple of watches, the 5ACTUS 70-5A 455 and the Lady Sports model 22MLW R-129. The second advert features the Vanac 52KAW 037, the LM 56LMW 566 and the Advan 70AD 405. This assists in determining the date as these models all only appear in the 1973 volume 1 JDM catalog. The models also appear in the 1973 volume 2 and 1974 volume 1 catalogs but in these issues the bracelet for the 56LMW 566 has changed in design. I think it is safe to assume that this campaign occurred in the first half of 1973. Below are the lyrics and comments from the rear of the record jacket. There are no lyrics provided for the third track. for the days to come Rah! Rah! Below are links to downloads for each of the tracks from the record. Track 3 - Let's Sing a Love with Seiko!